Were ’t not for the wrinkles in life’s face. –“Souls and Rain-Drops” by Sidney Lanier (1842-1881), found in The Joy of Words “from the library of Sheldon G. Ellestad.” This poem was published posthumously in The Poems of Sidney Lanier and characterized as one of his “unrevised early works” (per Wikisource at http://en.wikisource.org/wiki/Souls_and_Rain-Drops). They will pack selected poems into “jawbreaker capsules” along with candy, gum, or toys, and a chance to win a year’s subscription to Verse Wisconsin. Then they will load the capsules into a dispenser called the Verse-O-Matic. The Verse-O-Matic, packed with poems and goodies, will hit the road in April–National Poetry Month—visiting venues throughout Wisconsin. Then it will travel with the Verse Wisconsin editors to events, conferences, and festivals nationwide throughout 2011. “Luck of the Draw” poems will also be published in the summer 2011 online issue of Verse Wisconsin. Contributors of selected poems will receive one jawbreaker capsule with their poem in it, a photo of the Verse-O-Matic in action, and publication of their poem in the summer 2011 issue of Verse Wisconsin enhanced by an audio file. For “Luck of the Draw” poem submission guidelines, visit http://www.poetryjumpsofftheshelf.com/. Visit Pat’s blog at http://poetiosity.com/. August Moon Publishing House wants your best short story, reports Jerry Peterson. And, they will pay you for it–and publish it–if your story makes it into the top 10 of any of three divisions in the company’s short story contest. The divisions are: (1) Thriller/suspense, crime fiction/mystery, science fiction/fantasy, horror; (2) romance, paranormal romance, historical romance, chick lit; and (3) literary fiction. Seventeen First-and-Third members met at Barnes & Noble West (7:00-9:00 p.m.) to hear and help six fellow writers. John Schneller read from Chapter 1 of Final Stronghold, the third book in his fantasy trilogy. Pat Edwards said she considered the story as an allegory and needed a reminder in this chapter about who is exacting revenge and why. Millie Mader asked for clarification about how the character of Broken became Kotel. Jen Wilcher wanted to know whether you had to read the books in order to understand the plot, or would you be able to read them in any order. John recommended reading the trilogy in order, which generated discussion about how much back story was necessary at the start of the second and third books in order to bring readers up to speed for the third book. Randy Haselow was a little overwhelmed with the number of characters in the first chapter. Greg Spry suggested starting with the main protagonist. Clayton Gill noted John’s “sampling technique” of unnamed characters during a crowd scene and asked the group about other ways a writer could cope with dialogue and action to represent crowds of people. Patrick Tomlinson thought the chapter was dense with characters and action, but not overwhelming in the beginning. He thought a few characters could be held back until later chapters and then “trickled in.” Elijah Meeker cautioned John about the use of words out of place with a medieval or other old-time setting, specifically pointing out the use of “teens.” Pat thought there were a lot of “great visuals” in this opening chapter, which set the scene well and helped identify the characters as individuals. Skye Winspur shared a page of his alternative history about an aristocrat from the highly civilized and technologically advanced Muslim East on a quest in barbaric England which remains mired in the Dark Ages. Elijah wasn’t sure about the voice of the narrator, which he liked in the opening passages, but which seemed part way through to an omniscient narrator. He also questioned the proposition of selling life insurance to a Muslim. Patrick wondered how Europe had become a backwater, which is essential to the story, and recommended that Skye add some of that back story as soon as possible. Skye said he planned to explore historical info as the story developed. Pat liked the rich and poetic quality of the narrator’s language. However, Skye questioned his use of the term “smart-aleck.” Elijah was able to give him a quick web-search of the origin which appeared to post-date the story, especially as it originated in the British Empire. Pat thought use of the Muslim calendar year 1210 might be too arcane without some reference to the Christian calendar of the locals of “Lundewik” (about 1830 A.D.). Judith McNeil offered three more scenes of her radio play “South to Sunday.” Pat thought the dialogue was great, but wondered whether Judith needed to add clues to show the age of the different characters. Is it important to the story that there are age difference, Judith noted. She wanted to introduce age as both a barrier and as a bridge for one character to get to know another. Elijah thought the characters were a little too casual about the breaking of their “social contract” during their hours of travel by car. John said he did not know “where the story is going” by the end of the last scene. The conflict and choices could be more clear. Jerry looks forward to a main character’s reaction to the change of plans. Bill Dries wanted to know whether the Nebraska town in the last scene was big enough for a bus station. John thought a character would be more specific about where he worked in Wyoming. What city? Aaron Boehm shared the first part of his first attempt at a feature length screenplay, Hell Cage. Millie asked whether there was such a thing as steel cage wrestling. The answer: Yes, though Aaron’s version is extreme. Patrick wondered whether the wrestler Ash Tree Strangler actually strangles trees. Pat thought there was a lot of opportunity to salt some dialogue in there. Clayton recommended a few bloodthirsty old ladies in the crowd could cheer on the competitors and provide one of the views from the bleachers. Amber suggested some smack-down language in the locker room or in the arena aisles before the fight. Jerry pointed out that if one wrestler is from Madison, WI, then the other must be from a specific city in West Virginia. One of the Tuesdays members recommended the real town of War, WV. Elijah Meeker presented the beginning of his novel Heahwerdtunm, having converted Chapter 1 to the prologue, a series of letter through years between the main character and those who were close to him. Skye said this form of narration reminded him of Robert Lewis Stevenson. Jerry asked who Elijah had in mind as a target audience. Elijah admitted the Old English diction and invented words might make reading a challenge, but that he was trying to make it as accessible as possible. Jerry suggested the reader at the beginning of the book is looking for the kind of mindset they must have in order to read the book. A book that appeals to a very select audience is likely to be difficult for a general audience. Patrick agreed and added that Elijah might be too ambitious, at least at the start. Pat said her problem with the start of Heahwerdtunm was that none of what Elijah told Tuesday members about the story is actually in the piece he read. If the prologue anticipates the story, that anticipation should build from the beginning of the prologue, rather than appear in the last couple of paragraphs. Judith had read further in Heahwerdtunm than others at the meeting and said that Elijah’s storytelling technique becomes more readable later on. Cathy Riddle enjoyed the beginning set up in the form of letters. She thought of it as a primer in language and thought for what is coming in the rest of the story. Special thanks to Amber, who provided the August 17 Recap. August 24: Randy Haselow (chapter 2, Hona and the Dragon), Dan Hamre (short story, first five pages, “Tractor Jockey”), Andrea Kirchman (? ), Terry Hoffman (chapter, The Journal), Anne Allen (chapter, Homecoming), and Patrick Tomlinson (chapter, A Hole in the Fence). August 31: Fifth Tuesday, 7:00 p.m. meeting at the home of Cathy Riddle (3321 Prairie Glade Road, Middleton), details below. September 7: Randy Haselow (chapter 3, Hona and the Dragon), Cathy Riddle (chapter 6, Beer Crimes), Jen Wilcher (? ), Amber Boudreau (chapter 15, as-yet-unnamed-novel), Pat Edwards (poems), and Jerry Peterson (chapter 1, The General’s Watch). September 14: Dan Hamre (short story, last five pages, “Tractor Jockey”), Annie Potter (a memoir), Kim Simmons (chapter, The City of Winter), Holly Bonniksen-Jones (chapter, Coming Up For Air), and Carol Hornung (section, Sapphire Lodge), with room for one more. September 21: Chris Maxwell (? ), Millie Mader (chapter 20, Life on Hold), John Schneller (chapter 2, Final Stronghold), Judith McNeil (radio play/part 4, “South to Sunday”), Aaron Boehm (film script, part 2, Hell Cage), and Patrick Tomlinson (short story, part 2, “Any Port in the Storm”). Cathy Riddle will host our two groups to Fifth Tuesday at her home in Middleton on August 31. Jerry has posted directions to Cathy’s house via our Yahoo Groups e-mail. Our grand and glorious social event is only a dozen days away–August 31. Have you made your reservation? Send a note to Shel Ellestad or Jerry Peterson, telling them you are coming and who you’re bringing as guests. Yes, guests are welcome. Always. It’s also time to write your Fifth Tuesday mini-masterpiece, a fantastic excuse for being late to work. Here’s the set-up: You overslept. You’re late, and the boss is in your face about it. You’ve got to say something to get yourself out of trouble. Say it in 400 words or less, and send your magnificent lie to Jerry no later than Friday, August 27. Cathy told the First-and-Thirders, “There’s plenty of parking on the street.” But we’re talking about Middleton, so don’t give Cathy’s advert any ink in your Fifth Tuesday Writing Challenge. Usage: “Kate Neal’s Hourly Scrutinising floated ecstatically, emphasising irenic calm and harmony.” –Peter McCallum; A Beautiful Darwinian Experience; The Sydney Morning Herald (Australia); November 21, 2009. Garg’s “thought for today” is good, too: “You desire to know the art of living, my friend? It is contained in one phrase: Make use of suffering.” –Henri Frederic Amiel, philosopher and writer (1821-1881). For more: http://wordsmith.org/words/today.html. The citation: “A growing group of jobless across the nation are joining a self-proclaimed movement: ‘Funemployment.’ It’s a group of jovial unemployed who say they’re finally doing what they’ve always wanted to do—whether it is blogging or starting a nonprofit.” —Elizabeth Prann, “The Happy Unemployed,” Liveshots (Fox News), July 18, 2010. For them, email is too slow, so they text on their iPhones. Also, their telephones have never had cords, and the computers they played with when they were little are now in museums. If you’re writing for young adults, you should read Beloit College’s Mindset List to remind yourself of what the realities are in youth culture, so you and your book don’t come off looking silly because you used a handful of out-of-date cultural references. The title is Get Your Word’s Worth: 555 Tips for Improving Your Book Promotion by Brian Jud. Download from https://csp-mw-landing.s3.amazonaws.com/BookPromotioneBook.pdf. ● 184. Press Releases: Involve the reader in your press releases by using verbal play. Use a sequence of words or sounds that provoke repetition through its rhythm or alliteration. ● 353. Slogans: A fundamental rule of marketing is to find a need and fill it. Then let people know you filled it. ● 377. Take the “Junk” out of Direct Mail: Your plan should outline the actions you intend to take in six key areas. These are the books/products you offer, the target market, the special offer you are proposing, the format you present and the ways in which you test and evaluate your implementation. ● 506. Bookstore Events: we’ve actually found that signings are the lease effective author promotion which can take place in the store. What really works are events or panels. Marcella Smith, director of Small Press & Vendor Relations at Barnes & Noble, . ● 513. Exhibiting at Trade Shows: You will increase your chances for success at any trade show if you plan, promote a prominent display that communicates your message effectively to the largest number of attendees. The most epic of parking garages is located in the downtown Kansas City area. “The Community Bookshelf” features giant-sized spines of several great books including Joseph Heller’s Catch-22, Plato’s Republic, Ray Bradbury’s Fahrenheit 451, Ralph Ellison’s Invisible Man, and E.B. White’s Charlotte’s Web. 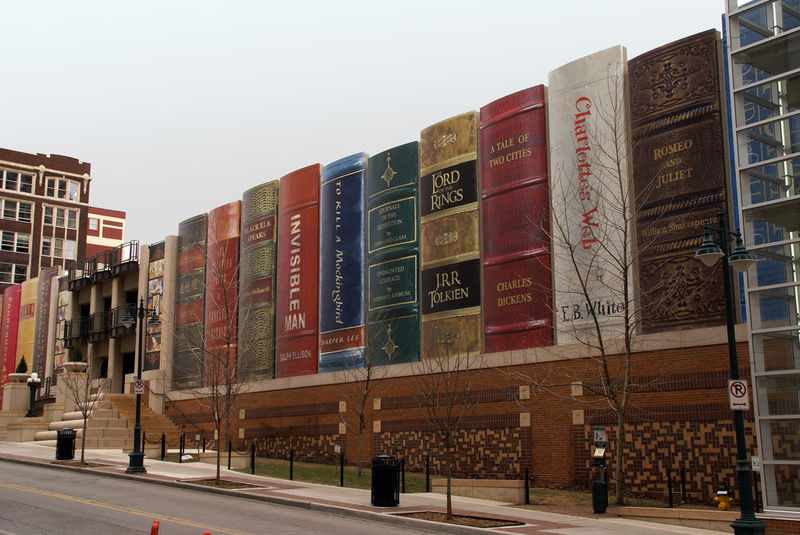 Answer this: If you had to pick an epic book worthy of a giant manifestation, which one would it be? For this GalleyCat correspondent it would be Mitch Albom’s Tuesdays with Morrie because it made me cry giant tears. Thanks again to all Tuesdays who contributed to this issue of Writers Mail.